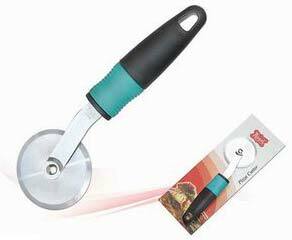 We are earnestly engaged in Manufacturing, supplying, and exporting a qualitative range of Pizza Cutter. We carry out our operations from Rajkot, Gujarat, India. We offer it to various pizza parlours, fast food outlets, and kitchenware dealers. It is known for smoothly cutting the pizza slices in a single stroke. We lavishly pack our Pizza cutter, to avoid any chance of damage during the transit. We manufacture it in compliance with the set industrial standards and norms.